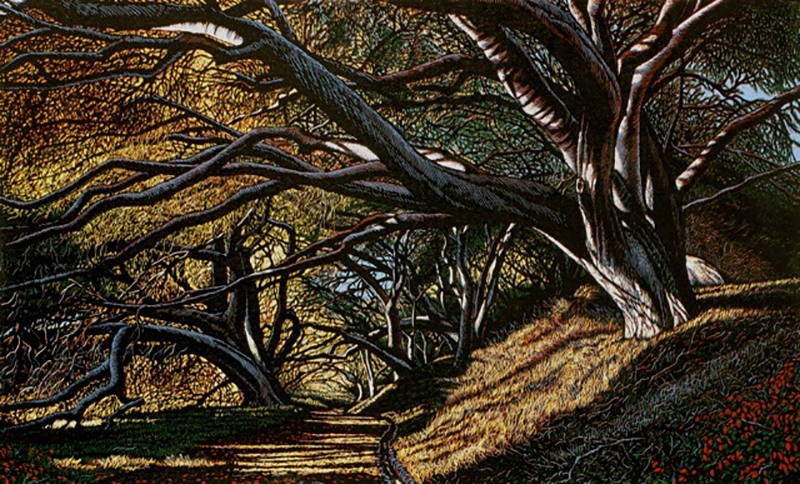 Sara Woodburn, Channel Islands, woodcut, 18×24 in. Marcia Burtt Gallery presents On Paper, an exhibition of diverse responses to the landscape on paper. Carolyn Lord, Susan Petty, and Nina Warner use traditional paper mediums watercolor, graphite, and gouache, taking advantage of the precise lines and edges that paper enables. Lord emphasizes shape and bright colors in her botanic paintings in watercolor; Petty creates intricate large-scale drawings in graphite; and Warner paints miniature landscapes in gouache reminiscent of tiny set designs. Marilee Krause and Randall David Tipton experiment with mediums and papers. As in poetry, Krause leaves room for the viewer to fill in the spaces. She uses watercolor to diffuse light on water and land, and pastel to superimpose minimal linear elements. Tipton’s ethereal paintings make use of Yupo synthetic paper to create unique pooling effects not achievable on wood-pulp or cloth-fiber paper. The firmament meets earth in his Northwestern landscapes. Pamela Zwehl-Burke gives us near-abstract paintings created in oil pastel that are as complex and brilliant as Byzantine mosaics. In contrast to artists who work directly on paper, Leonardo Nuñez and Sara Woodburn carve into linoleum and wood to create their images. Decisions about where colors and lines will go are made in cumulative steps of a complex conceptual process. Paper prints are the evidence of their refined craft. Anne Ward and Bill Dewey play with technology, expanding the artist’s studio to include computers and tablets. Bill Dewey’s photos may evoke nostalgia but the means of creating them are contemporary. Anne Ward’s brush and color selection is limited only by what program she uses on her tablet—her solution to an artist’s splintered daily schedule. Both camera and tablet rely on paper prints. Ian Roberts returns to the traditional, painting scenes during his travels using oil on paper to create a visual diary of his world. As it has been for nearly two thousand years, paper is still the blank sheet that elicits creativity. Pamela Zwehl-Burke, Crossing II, oil pastel, 36×50 in. 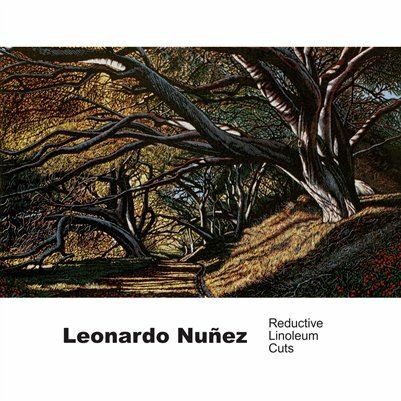 Leonardo Nuñez, Oak Tunnel, 9 color reductive linoleum cut, 19×31 in.